What to Stock in your Kitchen? 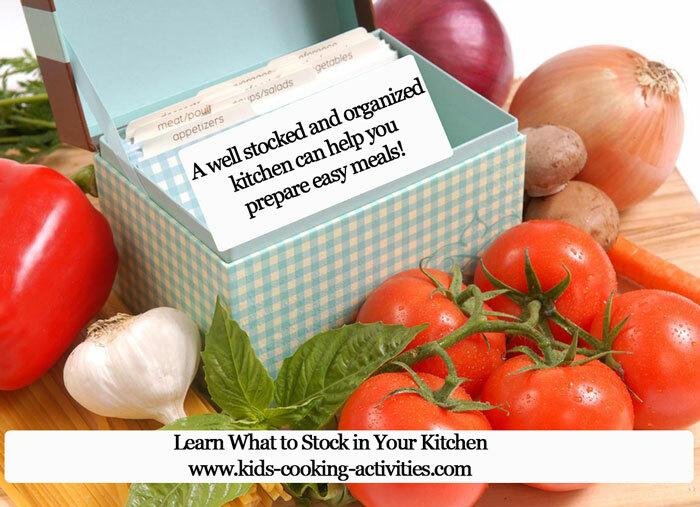 We've included this "what to stock in your kitchen" page because part of having easy kids meals is being well prepared and organized. Print off a copy and give your kids a clipboard with this page. Inventory your kitchen cabinets and kitchen pantry with your kid chef's help. Keep in mind every family is different so check this basic list and add or delete what works for your family. It is also important to have a way to keep track of what has been used and needs to be replaced so you keep your cupboards continuously stocked. What to Stock in Your Kitchen Shelves or Pantry? Canned vegetables, corn, green beans, etc. What to Stock in Your Refrigerator? What to Stock in Your Freezer? ***Some of these items don't need to be stored in the freezer but can be stored longer and fresher if done so. What to Stock in your Spice Cabinet or Baking Shelves? ***To provide easy access while you are cooking or baking move your spice cabinet and baking shelf next to the baking area (mixing bowl) and close to the stove. What to Stock in Your Kitchen That is Fresh? Other fresh fruits and vegetables that are in season and you use often. Here is to easy kids meals in the future!